Get the facts on the five D-Day beaches—code-named Utah, Omaha, Gold, Juno and Sword—that the Allies invaded. The westernmost of the D-Day beaches, Utah was added to the invasion plans at the eleventh hour so that the Allies would be within striking distance of the port city of Cherbourg. In the predawn darkness of June 6, thousands of U.S. paratroopers dropped inland behind enemy lines. Weighed down by their heavy equipment, many drowned in the flooded marshlands at the rear of the beach, and others were shot out of the sky by enemy fire. One even hung from a church steeple for two hours before being captured. Those who landed, meanwhile, often found themselves outside of their designated drop zones. Forced to improvise, they nonetheless succeeded in seizing the four causeways that served as the beach’s only exit points. On Utah itself, U.S. forces landed more than a mile away from their intended destination, due in part to strong currents. Luckily for them, this area was actually less well protected. “We’ll start the war from here!” U.S. Brigadier General Theodore Roosevelt Jr., the son of former President Theodore Roosevelt, shouted upon realizing the mistake. By noon, his men had linked up with some of the paratroopers, and by day’s end they had advanced four miles inland, suffering relatively few casualties in the process. 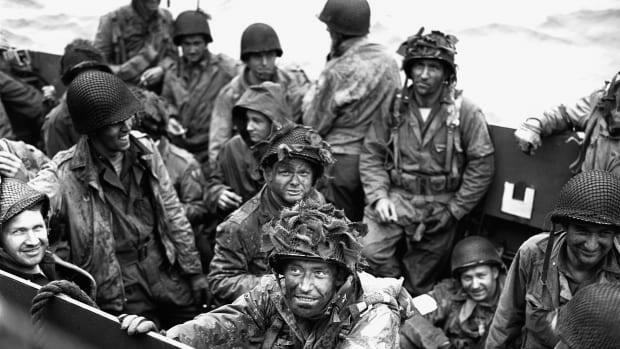 Surrounded by steep cliffs and heavily defended, Omaha was the bloodiest of the D-Day beaches, with roughly 2,400 U.S. troops turning up dead, wounded or missing. The troubles for the Americans began early on, when Army intelligence underestimated the number of German soldiers in the area. 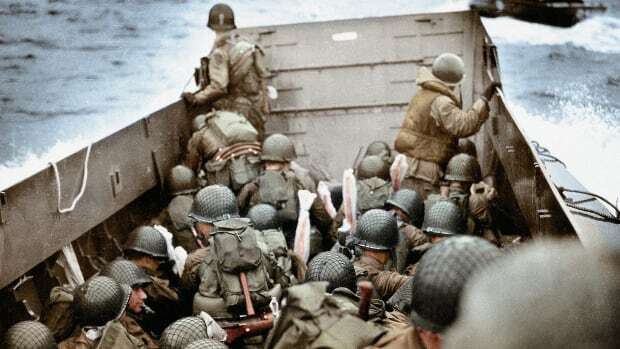 To make matters worse, an aerial bombardment did little damage to the strongly fortified German positions, rough surf wreaked havoc with the Allied landing craft and only two of 29 amphibious tanks launched at sea managed to reach the shore. U.S. infantrymen in the initial waves of the attack were then gunned down in mass by German machine-gun fire. The carnage became so severe that U.S. Lieutenant General Omar Bradley considered abandoning the entire operation. Slowly but surely, however, his men began making it across the beach to the relative safety of the seawall at the foot of the bluffs and then up the bluffs themselves. Assistance came from a group of Army Rangers who scaled a massive promontory between Omaha and Utah to take out artillery pieces stashed in an orchard, and from U.S. warships that moved perilously close to shore to fire shells at the German fortifications. By nightfall, the Americans had carved out a tenuous toehold about 1.5 miles deep. Owing to the direction of the tides, British troops began storming Gold, the middle of the five D-Day beaches, nearly an hour after fighting got underway at Utah and Omaha. 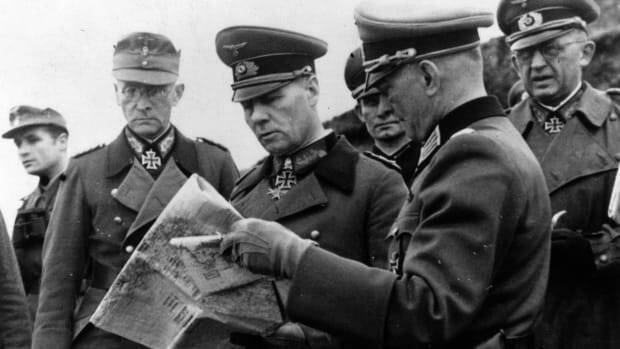 The Germans initially put up robust resistance, but in sharp contrast to Omaha, an earlier aerial bombardment had wiped out much of their defenses. British warships also proved effective. The cruiser HMS Ajax, for example, displayed such pinpoint accuracy from miles away that it apparently sent one shell through a small slot in a German artillery battery’s concrete exterior—the military equivalent of a hole-in-one. On shore, meanwhile, armored vehicles known as “Funnies” cleared away minefields and other obstacles. Within an hour, the British had secured a few beach exits, and from there they rapidly pushed inland. They also captured the fishing village of Arromanches, which days later became the site of an artificial harbor used by the Allies to unload supplies. 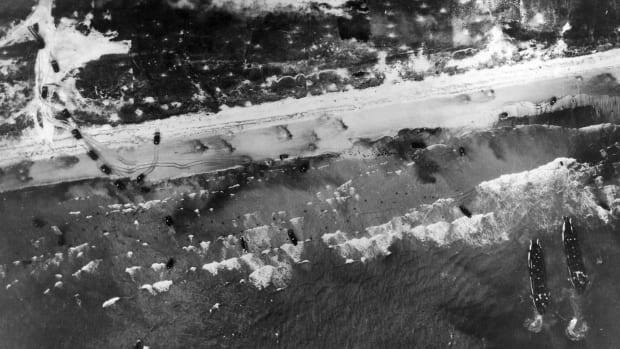 At Juno, Allied landing craft once again struggled with rough seas, along with offshore shoals and enemy mines. Upon finally disembarking, Canadian soldiers were then cut down in droves by Germans firing from seaside houses and bunkers. The first hour was particularly brutal, with a casualty rate approaching 50 percent for the leading assault teams. In the confusion, an Allied tank inadvertently ran over some of the wounded, stopping only when a Canadian captain blew its track off with a grenade. Other Canadians lacked any tank support at all. After fighting their way off the beach, however, German resistance slowed immensely, and the march into the interior went quickly. In fact, the Canadians advanced further inland than either their American or British counterparts. Though they didn’t quite meet their objective of taking Carpiquet airport, they captured several towns and linked up with the British on adjacent Gold Beach. Around midnight, British airborne troops, along with a battalion of Canadians, dropped behind enemy lines to secure the invasion’s eastern flank, just as the Americans were doing near Utah. Within minutes, they had taken hold of Pegasus Bridge over the Caen Canal and nearby Horsa Bridge over the River Orne. Other airborne troops destroyed bridges over the River Dives to prevent German reinforcements from arriving, and they also took out a key German artillery battery in a bloody firefight. The British then landed on Sword at 7:25 a.m., around the same time as at Gold but before Juno. 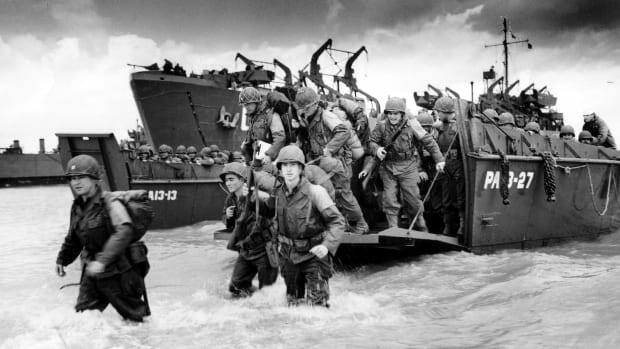 Although moderate fire greeted them, they soon secured beach exits with the help of the “Funnies.” Moving inland, they connected with the airborne units but faced relatively strong resistance in farmyards and villages. In a late afternoon counterattack, German forces made it all the way to the beach in one location, only to be turned back. 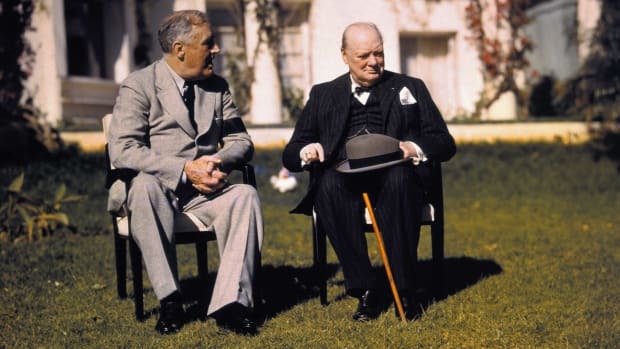 The Allies would not be able to unite all five D-Day beaches until June 12.